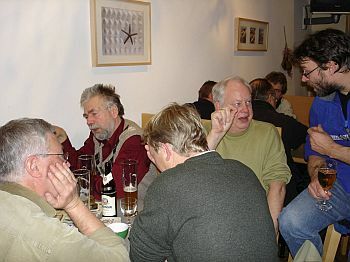 The 10th Goose Specialist Group meeting was held from 26-31 January 2007 in Xanten, Germany. The 10th annual meeting of the Goose Specialist Group in Xanten was a very well attended and lively meeting. No less than 113 people from 21 different countries gathered together in the youth hostel near Xanten, which bordered on a roost where many Greater White-fronted Geese spent the night. A very well chosen locality indeed. Johan Mooij and his staff of the Biological Station Wesel did an excellent job in organizing this meeting. We are very grateful to the many sponsors that enabled us to support many people in covering their traveling costs. The Dutch Ministry of LNV (Agriculture, Nature and Food Safety), the German Federal Agency for Nature Protection BfN on behalf of the German Ministry of Environment BMU, the Wesel County, North Rhine Westphalian Fund for Naturprotection (NRW-Stiftung), Research Institute for Nature and Forest INBO (B) Staatsbosbeheer (NL), Danmarks Jægerforbund (DK) on behalf of CIC, Deutscher Jagdschutzverband DJV (D), Rhein Main Kies und Split RMKS (D), RWE Rhein-Ruhr (D), Suhrborg & Co (D), Byk-Chemie (D), H.Scholten (D), Wasserverbund Niederrhein (D), Walsum Immobilien (D) and the Regionalverband Ruhr RVR (D) altogether supported the meeting with grants totaling 50.000 euros. Just like in gatherings of wild geese not all participants showed up at the beginning of the meeting, but from Friday onwards numbers built up gradually to peak on Monday 29 January when a peak of 113 people attending was reached. The top-three best represented countries were Germany (28 participants), the Netherlands (27) and Russia (12), followed by Sweden, Denmark, United Kingdom, Belgium, Ukraine, Finland, Norway, France, Estonia, Czech Republic, Uzbekistan, USA, Slovakia, Romania, Kazakhstan, Ireland, Hungary and Bulgaria. Also representatives from Wetlands International, UNEP-AEWA, CAFF, UNEP-WCMC were attending. The main idea of these meetings is to exchange information and new ideas and inform one another about many ongoing and starting projects. A total of 55 oral presentations and 29 poster presentations informed the participants on current goose research items. Quite successful for informal contacts was also the new concept of regular late night poster sessions, where people could discuss research in the poster room, while enjoying the excellent German beer. Because of the many presentations on top of the plenary session several parallel species-oriented sessions were held. The meeting started with an informal introduction on Friday night where we commemorated the sudden and tragic death of Elena Gurtovaya. Elena, the wife of Konstantin Litvin, was a very dedicated goose researcher, who participated in many expeditions to the Russian arctic and who attended many of our previous meetings. The next day the representatives of different authorities Helmut Stahl as Leader of the CDU parliamentary party in NRW, Jürgen Büssow as President of the Düsseldorf Region, Heinz Dams as Deputy Chief of Wesel County, Christian Strunk as Mayor of Xanten welcomed our group, and the mayor of Xanten kindly invited us for a special reception in the town hall of this very old Roman city. The main topics we discussed were, of course, scientific ones, but, as Bart Ebbinge announced that he would like to step down as chairman and was looking for a new chairman, also the future of the group as a whole and ways in which to restructure the group were discussed. Finally a resolution was adopted at the end of the meeting. The closing PowerPoint presentation is also available. On the topic of avian influenza Joost Philippa (Erasmus University of Rotterdam (NL) and Timm Harder of the Friedrich-Loeffler-Institut, Bundesforschungsinstitut für Tiergesundheit (D) gave very interesting presentations about the possible role that migratory birds have in transmitting highly pathogenic Avian Flu (HPAI). They reassured us that though it is possible that wild geese could transmit the disease (and this topic should certainly be studied), by far the most likely means of transmission causing the outbreaks worldwide is both legal and illegal poultry trade. The only wild species that so far has been found carrying and possibly transmitting H5N1over larger distances is the Mute Swan (Cygnus olor), and Didier Vangeluwe showed a short video about dying Mute Swans in northern Greece, just after an influx from the east after a cold spell in the winter of 2005-2006. Researchers, however, wonder why no further outbreaks have occurred in Europe in the winter of 2006-2007. It is intriguing to see the new developments in this species. Though the temperatures in spring have risen in the Dutch-German-Danish Wadden Sea, contrary to what one would expect Barnacle geese do stay much longer in that area in spring. Nowadays, as documented by Henk van der Jeugd and Rudi Drent using new techniques with satellite transmitters and small geolocators attached to legrings, many Barnacle Geese stay well into May in the Wadden Sea, and then skip the Baltic as a spring staging site, to migrate straight to the White Sea. Just like Brent Geese do. Are conditions on the former key spring staging sites like Gotland and Estonia deteriorating ? Are these areas filled up with locally nesting Barnacle Geese, or is the population size of Russian Barnacle Geese , now numbering 500,000 individuals, too large for these Baltic spring staging areas ? Many questions which are still unsolved. The increase in Barnacle Goose numbers is even reflected in the first individuals now moulting with Greater White-fronted Geese as far east as the Pyasina Delta. Also detailed annual migration patterns as revealed by satellite transmitters for the Barnacle Goose population that winters in Caerlaverock (Scotland) and nests on Spitsbergen were presented by Larry Griffin. Jouke Prop launched the new book ‘Wild goose dilemmas’, about the Spitsbergen, Russian and the newly developed Baltic breeding populations of Barnacle Geese which he wrote together with Jeff Black and Kjell Larsson. Being the most common goose species in western Europe, and the Niederrhein area around Xanten being one of its key wintering areas, many presentations focused on the Greater White-fronted Goose. Tracking Greater White-fronted Geese using recoveries of shot birds, resightings of neckbands and satellite transmitters based on the joined effort of the Dutch Institute Alterra and Helmut Kruckenberg provided insight in the migratory routes. Reports on staging sites in Ukraine and Karelia, and from expeditions to the breeding grounds on Kolguyev Island and the Pyasina Delta. The latter area in western Taimyr is also a major moulting site for hundreds of thousands Greater White-fronted Geese, and Yakov Kokorev reported about this area. During the excursion the participants also identified several tens of neck-banded birds, and a new website www.geese.org to report such sightings was launched during the meeting. Craig Ely, our special guest from Alaska, gave an overview about the phenotypic variation in this circumpolar species, and how this is maintained at the population level. During the Lesser White-fronted Goose Workshop Michael Wink showed the results of new genetic analysis of the complete captive stocks of Germany, Sweden and Finland, which will be used to build up a genetically “clean” breeding population in captivity. All hybrids will be removed according to Michael Wink’s results and a pedigree book on the individuals in these breeding stocks shall be started. Furthermore Wink’s study showed that the birds of the German captive breeding stocks are almost identical to the birds of the wild Russian population. Johan Mooij provided possible evidence for the existence of a historical migratory route of the species from Russia and Sweden to Western Europe, especially Germany, the Netherlands and Belgium. The participants of the workshop regarded the genetic issue to be solved and concluded that to really prove the existence of a westernmost flyway more data are needed. Because non of this new information had been available to IUCN and CMS bodies, the Scientific Council in particular, when they made their recommendations for the new International LWfG Action Plan, the workshop participants wish AEWA and other decision making bodies to incorporate these new results, as appropriate, into the new plan. Thomas Heinicke chaired a special session on Bean Geese, but also during the plenary sessions several presentations informed us about the two subspecies of Bean Geese, that used to be the most common geese in Europe some hundred years ago. Results of ring recovery analysis for staging Taiga and Tundra Beans in Germany showed, that Tundra Beans wintering in Germany and western Europa breed mostly in the tundra of European Russia, but to a small extent also in northernmost Norway and in the Westsiberian Arctic. In opposite, Taiga Beans wintering in Germany, originate from two different breeding areas: Fennoscandia and Western Siberia. Taiga Bean Geese from Western Siberia use a migration route crossing the Central part of European Russia, whereas Tundra Beans migrate in autumn and spring mainly across the White Sea area and the Baltic states, but in spring use additionally also staging areas in Central European Russia. Due to ring recoveries, there is a small, but regular exchange between Tundra Beans wintering in Western Europe and the Pannonic region and Westsiberian Taiga Beans, wintering in Europe and Central Asia. Typical for the high hunting pressure was the report on Taiga Bean Geese (Anser f.fabalis) from Uzbekistan. In the 1970s still several thousands were wintering in Uzbekistan, now none, because of excessive hunting pressure. In those years several Taiga Bean Geese that had been marked as far west as the Netherlands in severe winters as adult birds, were shot in later years in Uzbekistan. Other presentations focussed on new information on Taiga Bean Geese in Scandinavia, especially a observed change in migration routes and site use of staging and wintering Taiga Beans in Sweden and new information on numbers, spring staging areas and migration routes of the Swedish breeding population. As a result of the Bean Goose workshop, a urgent need of further research on several topics including taxonomy, migration and migration patterns, numbers and distribution in breeding and non-breeding time, monitoring and conservation status of the different populations was agreed among all participants. To improve future activies, a new e-mail group and establishing a special website on Bean Goose issues were proposed. From the wintering grounds an alarming decline in numbers is reported, whereas reports from the arctic nesting areas in Taimyr a range expansion was reported. This conflicting information clearly requires further investigation. Is it possible that high numbers are missed during the midwinter census, because during the relative mild winters larger numbers are wintering in Ukraine ? A challenging task for Lavinia Raducescu, the new coordinator for this species from Romania. While the Iceland/East Greenland population seems to have leveled-off at around 250,000-300,000 geese, the Svalbard populations continues to increase and has now reached a level of 56,000 (2006). At present, there are signs of density dependent effects on breeding bird numbers and fecundity; however, there is no suggestion of density dependent effects on population size. Within the EU 5th Framework project FRAGILE intensive work has been carried out towards an integrated prediction of how Arctic geese, with focus on Svalbard nesting pink-footed geese and barnacle geese, may be affected by climate change throughout their annual cycle. Newly developed GIS layers of tundra vegetation, surface temperatures, elevation models, snow distribution have been used is predictive models of scenarios of future climate change for Svalbard. For the winter range, CORINE land cover layers were modified and used to predict suitable winter sites. Significant predictors were used to suggest future distributions under various scenarios of land use change. Furthermore, climate effects on migration and breeding phenologies, spatial distribution during breeding and wintering and individual fitness and population consequences were analysed based on time-series data. Contrary to recent suggestions, the analyses suggest that at least in the median long term, a warmer climate scenario will largely have a positive effect on the performance of this population, with potential for continued population increase. In a workshop focusing on the long-term study of the Svalbard population of pink-footed geese (chaired by Jesper Madsen), it was announced that due to new funding based on a grant from the Danish Forest and Nature Agency, the marking and resighting programme is going to continue for at least 3 more years (2007-2009), including studies density dependent processes and effects on the breeding grounds. The Belgian, Dutch, Danish and Norwegian partners in the programme all expressed enthusiasm to continue the existing collaboration, including systematic population monitoring, age ratio and brood size assessments. This collaboration has proved very fruitful and efficient in providing improved data at high speed. Dark-bellied Brent Geese have declined from 300,000 to 200,000 during the last decade because of poor reproduction, but fortunately 2005 was quite unexpectedly a good breeding season again. The research on the factors causing this poor breeding will be continued by Bart Ebbinge of the Dutch Institute Alterra in cooperation with the Russian Heritage Institute and the Extreme North Agricultural Research Institute from Norilsk during the International Polar Year ( in 2007 and 2008). Preliminary results of a joined analysis of Bart Ebbinge and Preben Clausen about the impact of hunting on this population before 1972 were presented. The Light-bellied Brent Geese wintering in Denmark and NE-England are still low in numbers as Preben Clausen from NERI reported. Using satellite transmitters many interesting details about the nesting areas of this small population were discovered on both Spitsbergen and NE-Greenland. There were no reports about the larger group of Light-bellied Brent Geese from NE-Canada that winter in Ireland. Geese are still hunted in many countries, and restrictions on hunting have shown to have a major impact on both goose numbers and goose distribution. As a result of these restrictions on hunting most populations have recovered, though it is also argued that improved agriculture is the main cause of increased goose numbers. In the final resolution countries were called upon to properly document the number of geese shot. Goose population sizes using the database of Wetlands International. Simon Delany, Toon Helmink and Frans van Bommel presented the present state of the database with all mid-winter censuses of geese in Eurasia. Regrettably the recent increase in goose numbers does not show from the data in this database, because many data have not yet been collected from the national coordinators. There is a huge backlog but Wetlands International and Alterra are presently working hard to re-establish contacts with national coordinators and make sure that the database will soon be up-to-date. For the recent population estimates in the fourth edition of Waterbird Population Estimates data were collected separately. 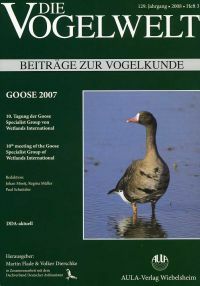 Many people felt the need for an updated version of GOOSE POPULATIONS OF THE WESTERN PALEARCTIC - A review of status and distribution, edited by Jesper Madsen, Gill Cracknell and Tony Fox (1999), which is no longer available. New Goose Management in the Netherlands. Robert Kwak gave a presentation about the new goose conservation strategy (the so-called Beleidskader Faunabeheer) of the Dutch government to try to stop a further increase in the costs of compensating farmers for goose damage, now amounting roughly 10 million euros annually in the Netherlands. The plan is to concentrate the wintering geese on about 80,000 hectares of grassland, and scare the geese from other areas. Farmers in each Dutch province have to allocate a certain area to accommodate geese in suitable wintering areas, and the provincial governments have to issue licenses to scare away the geese from other areas also making use of shotguns. This new plan will be monitored during three years carefully by a consortium of Dutch research institutes, led by Alterra. The Dutch government is well aware of the important international role the Netherlands play in accommodating no less than 1,5 million Eurasian geese in winter. Restructuring the goose specialist group. The Chairman Bart Ebbinge indicated that he is looking for a successor in the coming years. Again someone with sufficient instutional backing is required to chair the group. In order to alleviate the present burden for the chairman suggestions were made to restore the old situation with species co-ordinators and add several topical co-ordinators (age-ratio assessments, hunting, etc.). 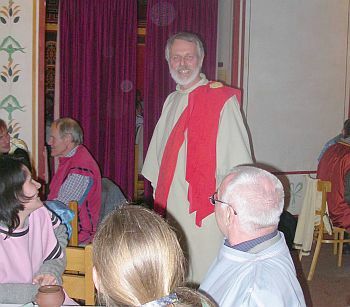 Since not all goose specialists were present in Xanten, people who are keen on leading such working groups are invited to inform the chairman about this before 31 May 2007. The procedure will not be democratic, but more like gulls settling in a colony and establishing their own nesting territories, while also benefiting from the colony as a whole. Tony Fox and Preben Clausen drafted a first proposal for this during the meeting (see under Working Groups). To allow everybody to participate in this process I deliberately left out all names mentioned. From this group of working group leaders a board can then be selected to assist the chairman. I hope that in the autumn of 2007 such a board will come into existence, to help prepare future meetings and other potential activities of the group.